It's getting to that time of year, my favourite time of year, when festivities begin. For me, festivities always include a tipple or two - however last year I was in early pregnancy so couldn't enjoy that privileged. So this year, I shall be making up for it - I kid, don't worry. But I've definitely had a few thoughts as to what drinks I like as I know my mum usually begins to stockpile shortly. Since going on my sisters hen do, and sampling one of the best cocktails I ever tasted, I've been trying to recreate it constantly, until I did the obvious and found the recipe on the bars website. I bought the ingredients and began to make my drink, though it just didn't have the same taste to me. 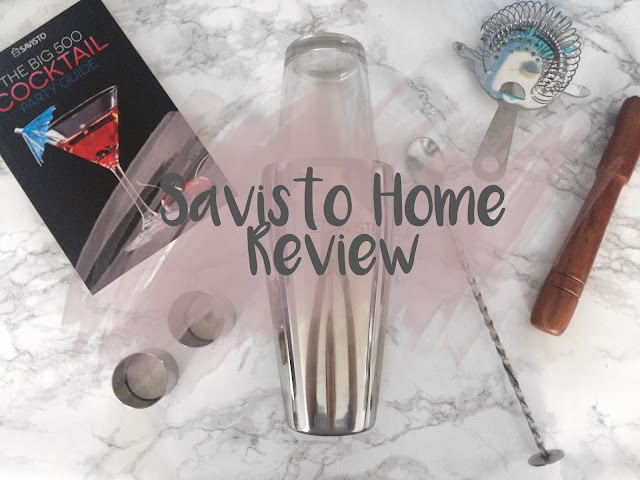 So, when Savisto Home got in touch and asked me to pick something to review, I immediately jumped at the chance to review a cocktail set, knowing this may be the answer to my cocktail woe. And it was. Their set comes with all the right bits and bobs to get a novice like me off the ground. It had a stirrer, crusher, two shot measurements, a strainer and of course your cocktail shaker, it even came with a handy cocktail guide which I may or may not have marked down my favourites from. The crusher for me was amazing, I crushed all my ice into a slush effect just like the Cocktail I'd previously sampled had and it made such a difference - I was completely thrilled. Yes, a good drink is really the key to making a very tired mother happy. Savisto are a fairly new homeware brand on the market, but it's easy to tell they'll be successful. This set was definitely more luxury than those you can grab from your local supermarket, it felt heavy duty and like it could take some serious partys on. The measurement cups are perfect for those who may want to keep a check on their units, perhaps if they're driving or just simply want to remain fully in control. Something which can be hard when you're having a cocktail as it's usually pot luck as to how strong it's going to be. Stay tuned for another post coming up, with some of my cocktails making skills in action, along with a few little recipes for the festive season. I'm Happy To Be A Working Mum.